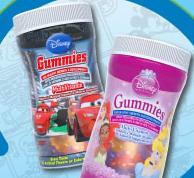 Click here to visit the Disney site and you’ll be able to request a free sample of their Vitamin Gummies. They let you choose between princess or cars. Allow up to 8 weeks for delivery. I think the link is bad. It should give you a form to fill out. Mine says will be here in about 8 weeks. You have to click under the photo where it says “click here” and it takes you to another page where you fill out the info. I did not get to click on the must be 18 year of age and I am but went back to request and it will not allow me to bc it says not 18 ??? I like to sample !! How do I get my free sample ? Click on the picture and you will fill out a reuest form. Everyone needs a Disney vitamin. Link went directly to the form, and my sample is on it’s way. Great vitamins. Kids love them. Kids are gonna love these.